PGI identified some 40 years ago that a flame resistant hood was an integral component of a firefighter’s personal protective ensemble. It’s only fitting that the originator of the first fire fighting hood would develop the next generation of fire fighting hoods for today’s first responders. You ultimately judge a firefighting hood by how well it fits, how well it performs and how comfortable it feels. The Cobra™ NextGen™ Hoods, manufactured by PGI, outperform conventional fire fighting hoods on all three counts. The new line of Cobra NextGen Hoods, introduced at FDIC 2016, builds on our most popular Cobra Ultimate Sure-Fit™ Hood with improved contour that better shapes to one’s head for improved fit and comfort. A fuller cut builds a little “ease” into the hood so it doesn’t fit skin tight like typical fire fighting hoods. This more generous cut provides improved thermal resistance from heat and flame due to the extra space (layer of air) between hood and head. Plus, a 1.25" increase to the width of the patented Sure-Fit panel affords a more consistent seal fit with most SCBA masks and mask hardware. 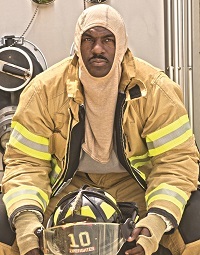 Traditional manufacturers of fire fighting hoods tend to skimp on fabric. PGI’s industry leading experts added six additional inches to the width of each hood to provide exceptional coverage while reducing bunching at the chest and back. The market’s longest hood, measuring a full 23" (five inches longer than standard NFPA requirements) — ensures complete chest and shoulder coverage and helps to keep hoods tucked in even after laundering shrinkage. All Cobra NextGen Hoods are UL Classified to meet or exceed the design and performance requirements of NFPA 1971 Standard on Protective Ensembles for Structural Fire Fighting and Proximity Fire Fighting. And, with nine flame resistant fabric choices available, multiple contrast stitching options and the ability to customize your hood with embroidered patches or ink heat transfers, selecting the right fire fighting hood has never been easier. Cobra NextGen Hoods are now available from PGI as well as leading fire service dealers around the world. For more information on Cobra NextGen Hoods visit NextGenHoods.com or call 800-558-8290.